M81 image made by combining data from UVW1, UVM2 and UVW2 on XMM-OM. 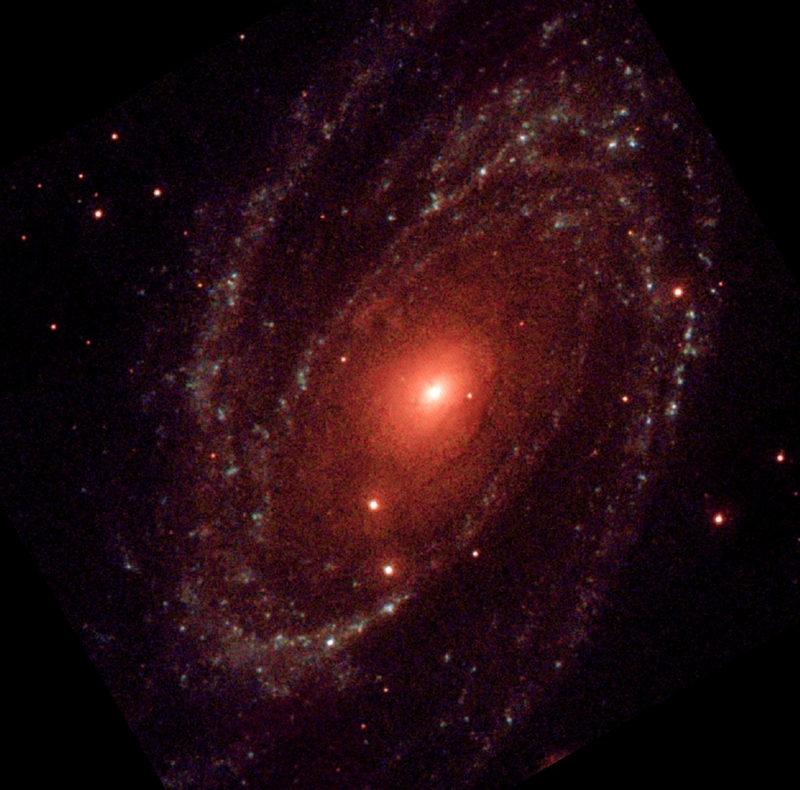 A combined UV and X-ray colour image of M81 taken with the XMM-Newton Optical Monitor and X-ray Telescopes. The spiral galaxy M81 (NGC 3031), in the constellation Ursa Major, is made up of billions of stars and is situated some 12 million light-years away. 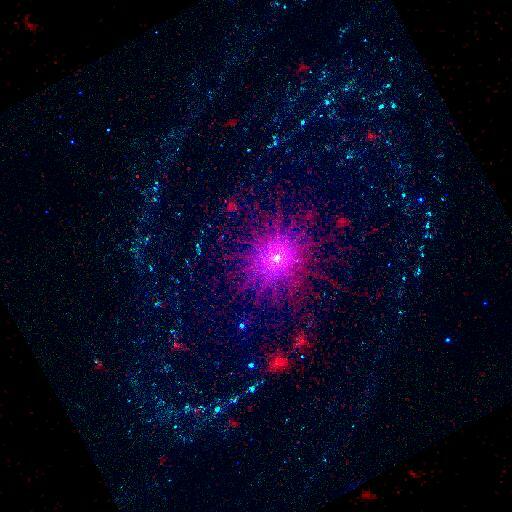 These UV and X-ray images of M81 are made by different instruments on the XMM-Newton satellite and highlight different aspects of the galaxy. The top picture combines three ultraviolet images from the Optical Monitor telescope, in which blue indicates hotter emission and red indicates cooler emission. The image covers a region approximately one quarter of a degree on a side. It is formed from three 1000s exposures taken in different filters that are centred on approximately 2000, 2300 and 2800 Angstroms respectively. The spiral arms of the galaxy are traced out by hot, star-forming regions which are bright in the shorter wavelength UV bands. The predominantly blue-coloured point-like objects are foreground stars in our own galaxy. The bottom picture combines the UV data with data taken by the EPIC-MOS X-ray camera on board XMM-Newton, which is sensitive to radiation in the 0.3-10keV range. Bright red areas show regions of X-ray emission. The point-like LINER nucleus is visible at the centre of the galaxy, where the X-ray emission is powered by gas falling into a massive black hole. Other bright spots or X-ray emission are produced by binary stars or supernova remnants. Data courtesy of Alice Breeveld, Keith Mason (MSSL) and the XMM-RGS consortium led by A. Brinkman (SRON).